Berthas Revenge Irish Milk Gin is a popular Gin available from DrinkSupermarket.com in 70cl to buy online. Visit DrinkSupermarket.com for the best price for 70cl of Berthas Revenge Irish Milk Gin or compare prices on our other Gin products. 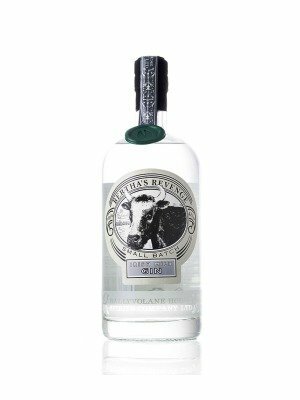 Bertha's Revenge Small Batch Irish Milk Gin is made by Ballyvolane House, Cork. Named after Bertha, a Droimeann cow from Kerry who was believed to have been the oldest cow in the world, the concept originates from Ballyvolane being the Gaelic for 'the place of springing heifers'. The gin itself is a good mix of spice and fruity vibrance. Fittingly made from whey, not grain, the unique mix of botanicals includes grapefruit, cinnamon, cloves, cumin, elderflower, Alexanders and sweet woodruff. Exceptionally smooth and soft without much burn from the alcohol, the flavours are more citrus dominated than the nose suggests with the spice elements coming through strongly on the finish. Despite the silly name, this is a seriously good gin, try it in a Negroni or classic Martini where the flavour should really shine. Where to buy Berthas Revenge Irish Milk Gin ? Berthas Revenge Irish Milk Gin Supermarkets & Stockists. You can buy Berthas Revenge Irish Milk Gin online in most retailers and find it in the Gin aisle in supermarkets but we found the best deals online for Berthas Revenge Irish Milk Gin in DrinkSupermarket.com, Amazon.co.uk, 31dover.com, and others. Compare the current price of Berthas Revenge Irish Milk Gin in 70cl size in the table of offers below. Simply click on the button to order Berthas Revenge Irish Milk Gin online now.